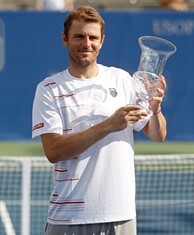 Mardy Fish won the Atlanta Tennis Championships for the second straight year. NORCROSS, Ga. (AP) — Mardy Fish gave himself little credit for saving two second-set match points against John Isner. "When you're in that position, it's almost over," Fish said. "I was lucky to get out of it. I played some good points. I don't think he missed any first serves there. I stuck some returns and put some balls in play." Fish beat Isner in the final for the second straight year at the Atlanta Tennis Championships, earning a 3-6, 7-6 (6), 6-2 victory Sunday. The world's No. 9 player recovered from a 5-1 deficit in the tiebreak. "I didn't necessarily change anything tactically," Fish said. "I took care of my serve games a little bit better once I lost serve in the first game of the second." Isner was trying to win consecutive events for the first time in his career just as Fish did in 2010 at Newport and Atlanta. But the 6-foot-9 Isner's last service game included two double-faults. He committed 29 unforced errors to Fish's 11 through two sets. After blowing the two match points, Isner couldn't regain momentum. Losing the point on his serve hurt badly. "I missed the first serve," he said. "In hindsight, I probably should've served and volleyed on the second serve. I should've done that more during the first of the match to begin with. He got it in play, and I went with too big of a backhand and missed it by a lot. You know, he played that point well. And the next points after that, he served two really good serves. Um, but that's what happens." Isner seemed to grow tired from answering questions about the missed match points. "Look, the match was in my hands," he said. "I was up a set and a break. It's as simple as that. I did not get it done. I've lost five finals in my career. Two to Mardy, two to Sam (Querrey), two to Andy (Roddick). Obviously, I wish I could've won every single match. This is the second one I've had match points in and in the other ones I've been one, two points away, so I don't know what it is." Fish credited a new fitness regimen with helping him maintain focus, but he wasn't sure what to think of the fatigue Isner showed as the match wore on. "You never know," Fish said. "He looks like that a lot. Sometimes it might be a ploy because you're not sure how tired he is. He can hold his serve so easily so many times that he can kind of get his energy back. I didn't think fitness was a huge part of it. I certainly felt great, and maybe it got me an extra break in the third set, the second break." An upset stomach affected Isner throughout the match. He decided to break custom and not eat a snack during the match. He drank only water. "Physically, I ran out of gas in the third set, but I didn't feel my best out there," Isner said. "Maybe it was the heat. I don't know what it was and that was certainly the difference in the third set." Fish improved to 6-12 in ATP tour finals, 3-1 in his career against Isner. Sunday was the first time he defended a championship successfully. "It feels great to win here again," Fish said. "It feels great to start off the summer like I did last year." Isner sounded as if he might need a couple of days to get over a chance to win his second straight event. "I had a match point on my serve," Isner said. "You can't ask for much more than that. That's how it goes. It's still a good week. I really, really wish I could've won this title. It wasn't to be." Matthew Ebden of Australia won his second straight doubles title, teaming this week with Alex Bogomolov Jr., in a 3-6, 7-5, 10-8 super-tiebreaker victory over Matthias Bachinger and Frank Moser of Germany.